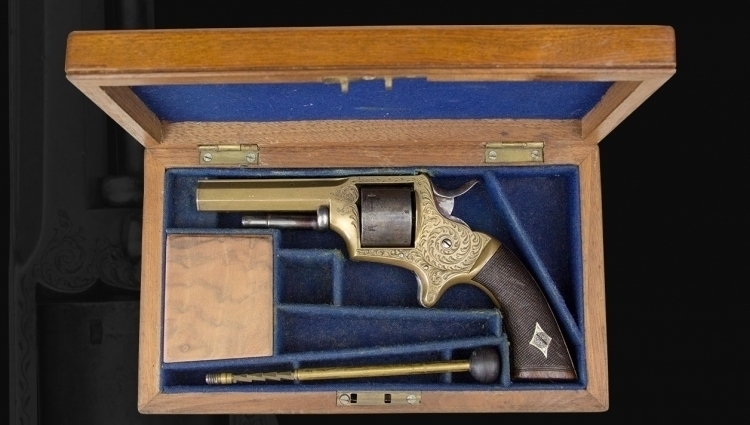 PLEASE CLICK IMAGE TO VIEW - CASED .30, 6 SHOT RIM-FIRE BRASS FRAMED TRANTER REVOLVER - with 7.25cm hexagonal barrel and frame cast as one, the former with raised sighting flat and bead fore sight and the latter almost entirely engraved with foliate spirals, six shot colour case hardened plain cylinder, spur trigger and two piece very finely chequered walnut grips and contained in its walnut baize lined compartmented case with clearing rod. In good condition, nice tight action, lock up almost solid, some wear to bore and chambers but entirely serviceable. It is necessary occasionally to depress the trigger before cocking but otherwise functions well with strong spring pressures. Revolver 17cm overall. The case 20.5cm x 11.75cm. The case very good but no key. Birmingham Proofs.